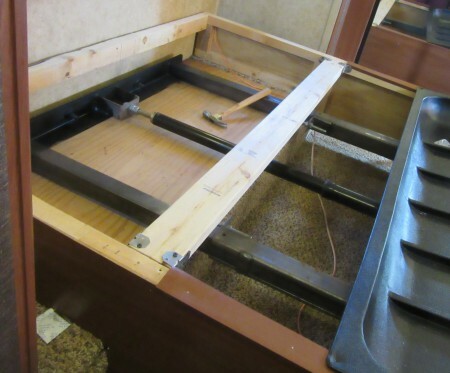 March 27, 2016 RV repairs (by Jimmy) – In February, between Angela’s 2nd and 3rd trips to Virginia, she was looking at the bed. Let me repeat that. In February, between Angela’s 2nd and 3rd trips to Virginia, she was looking at the bed. Now let me translate that. There’s something wrong with the bed, and it needs to be repaired. Okay, to be fair, I do have a tendency to roll toward the middle, but I always thought that was my side anyway, so I didn’t think anything about it. We took the mattress off the bed, and there was some mildew/mold underneath. (Note: We believe the mildew/mold is a result of the heat issues of January and February discussed here.) Luckily, it was only on the mattress cover and not the mattress itself ($75 cover versus a $300 mattress). There was mildew/mold on the bed base that needed to be removed, and we were able to verify that the head of the bed did seem to be pulled away from the wall. Head support does not reach the slide wall. So this weekend, with Angela home again and it sunny rather than raining, it was attack the bed weekend. We took off the mattress and put it in the living room. 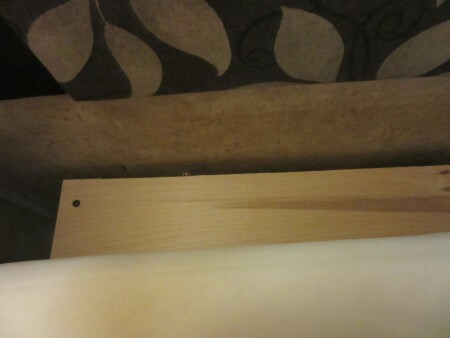 I then removed the two bed support boards that support the mattress. At this point, I found out why I gravitated towards the middle (it wasn’t all because Angela was on the other side). 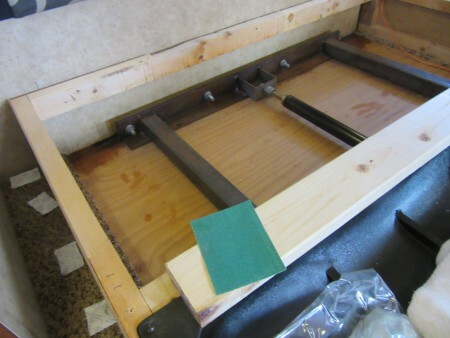 You see the support brace was made out of five small pieces of 2 x 2s, finger-jointed and glued together in four places, and one of those joints had given way. 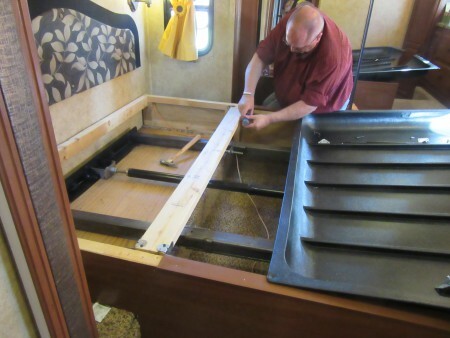 This shows that we full-timers must realize that most RV’s are built for weekenders. 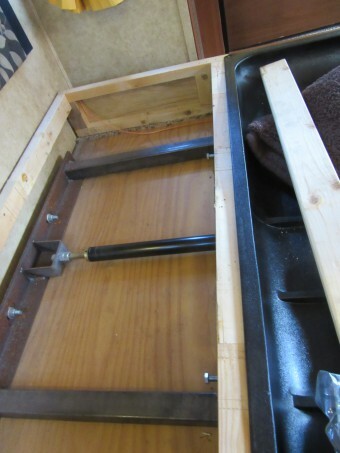 Removed mattress and lower board. Upper board still to be removed. Okay, so the bed is broken. Angela was right. Let me repeat that: Angela was right. Let me translate. Good Lord, Angela was right again. 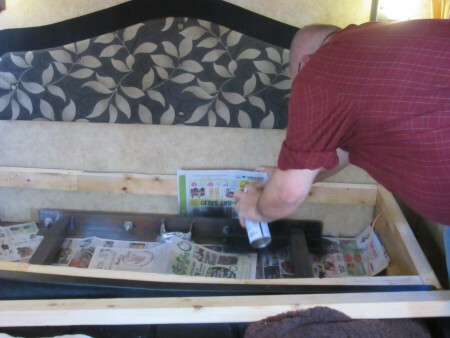 To remove the mildew from the bed boards, we first sprayed a mildew remover on them, then wiped them clean. 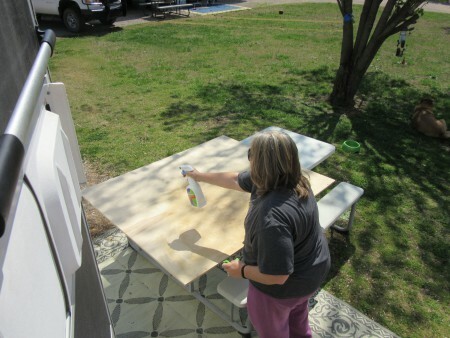 To prevent mildew from returning we painted the boards with Kilz. 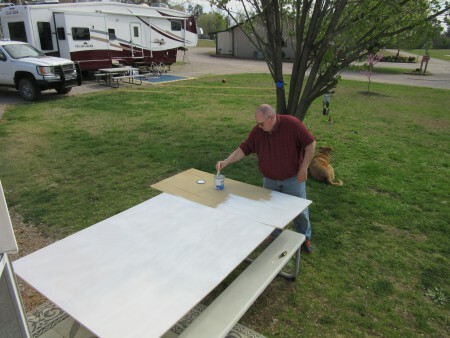 We also noticed that the slide-pull had some rust on it, so we sanded it and painted it with Rustoleum. 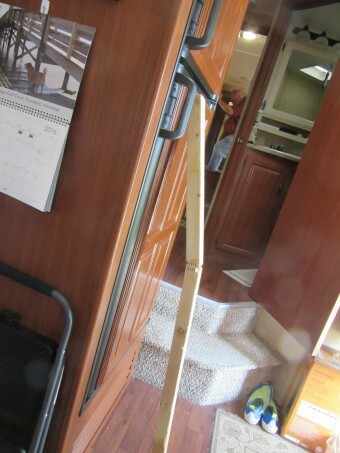 To repair the broken support brace (and to upgrade it for a couple living in the RV full time), we bought a 2 x 4, cut to length, and installed it with decking braces. This provides for a solid beam (no glued joints) that is twice the size of the one being replaced. This should hold for the life of the RV. For the header board we found that it was designed to be away from the wall, but the screws were pulled half way through the header board. We bought replacement screws and put washers on them so that they wouldn’t pull through. Most of the things we already had, but we did have to make a trip to Lowe’s (yes. Jimmy Johnson goes to Lowe’s – even though they won’t give me a free hat). With the $75 mattress cover on order, we probably spent another $25 in supplies. So, for around $100 we now have a bed that will support us through our journeys. This also reminded me of a lesson that, after nearly ten years of being married to Angela, I should have known already. She is in the RV more than I am; I should listen to her concerns. She holds the pulse of the RV. You were right honey. Translated, I fixed my bed; I’ll lay in it.